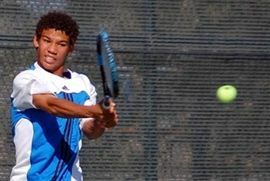 Many of the Section's top juniors, and several out-of-Section players also competed at the Dan Konchan Memorial Tournament, a Level 5 tournament that gave out national ranking points. The Konchan tournament, formerly named the Valley of the Sun Junior Championships, was played at three separate sites in the Phoenix metropolitan area, including Scottsdale Ranch Park, Indian School Park and Gene Autry Sports Complex in Mesa, Ariz. This year's field was the largest ever, as just over 200 competitors took park, including out-of-Section players from Washington state, Texas, California, Colorado, Montana, Utah and Massachusetts. A special thanks to the sites for allowing us the use of their sites, as well as to the volunteers who helped out at the event.